Some cook because they have to, some when they want to, and for some there is not much distinction between the two. For this last group, cooking is a satisfying pursuit on any terms, and learning about a cuisine with which they have only the briefest or no acquaintance is their idea of a good time. Some of the ingredients will be strangers. Even familiar ones combine in unfamiliar ways. And in the end, there is the element of surprise. You don’t really know what to expect–unless you are hoping to recreate what someone else has made for you. Mexican cooking is so varied and complex–it contains learning experiences even for cooks who know it well. Good guides through any level of learning are useful. Friends, whose kitchens you visit from time to time and whose food you eat, teach without teaching–the best way to learn. Good books help, too. In America, one of the best known writers about Mexican cooking is Diana Kennedy. Reading her books, one gets a sense of competence and authority you can trust. The late Elisabeth Lambert Ortiz is another fine writer on the subject, who began her study of Mexican food as a way to learn the language and the culture when she moved there with her diplomat husband. Jim Peyton is a third good guide and has a website, lomexicano.com, from which this recipe for Cream of Pecan Soup is drawn. Mrs. Kennedy, Mrs. Ortiz and Mr. Peyton really offer complimentary ways of learning about Mexican cooking. Starting with one of Diana Kennedy’s cookbooks, however, is like playing the fugue before the prelude. Recipes by Mrs. Ortiz or Mr. Peyton are a better place to begin. They lead nicely into Mrs. Kennedy’s more intricate versions. 1. Melt the butter in the pot and add the minced onion. Cook it, stirring from time to time, until it softens. 3. 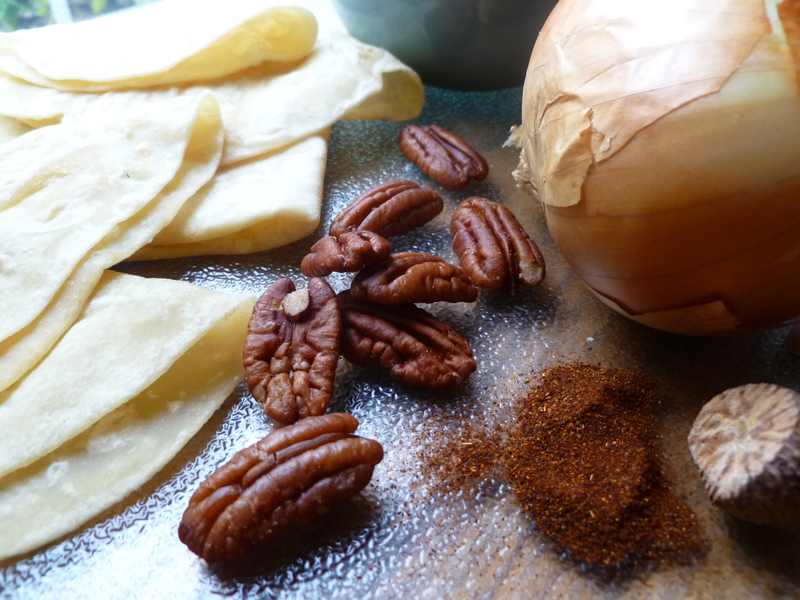 Stir in the pecan paste. Add the chicken bouillon, a little at a time, stirring, just as though you were adding liquid to a cooked flour and butter mixture to make a sauce. 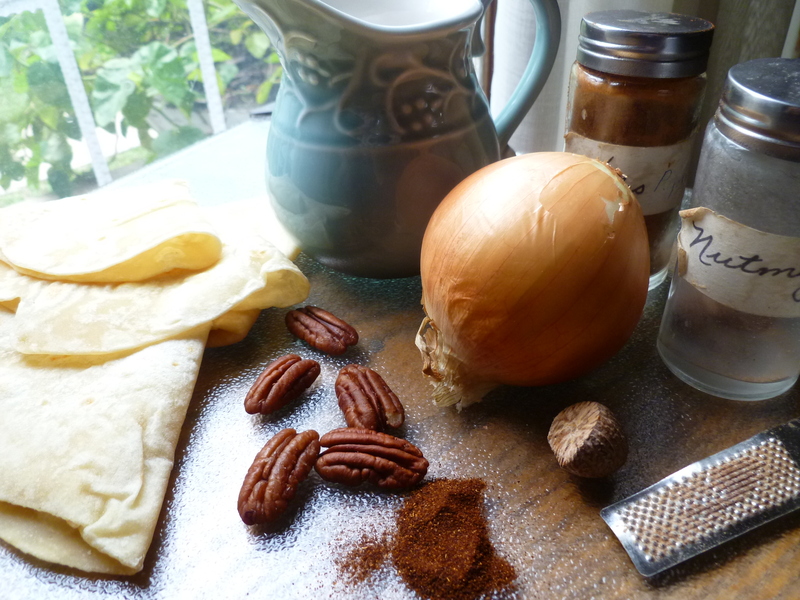 Each addition of bouillon should be well combined with the pecan/tomato/onion paste before adding more. 4. Bring the soup to a boil, then turn it down to a simmer and cook it for about 10 minutes. 5. Salt the soup; add the cream. The soup may be made a day in advance, cooled, and kept in the refrigerator. Bring it to a simmer before serving and taste it for seasoning. Ladle the soup into bowls. 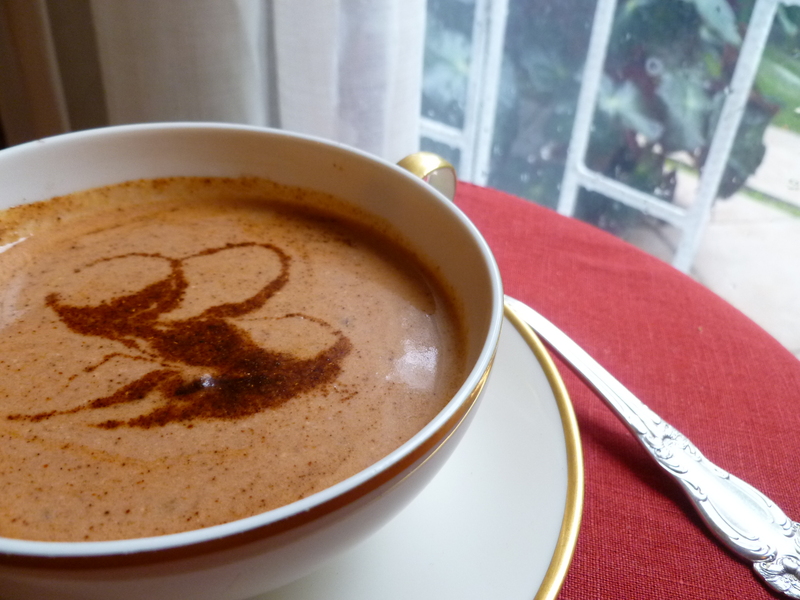 Grate some nutmeg over each bowl of soup and garnish it with the Paprika or in another way. For the Paprika garnish: Sprinkle a big pinch of Paprika in a line (about 2 – 3 inches long) down the middle of each bowl of soup with your fingers. Swirl the line around over the surface of the soup with a toothpick or wooden skewer. 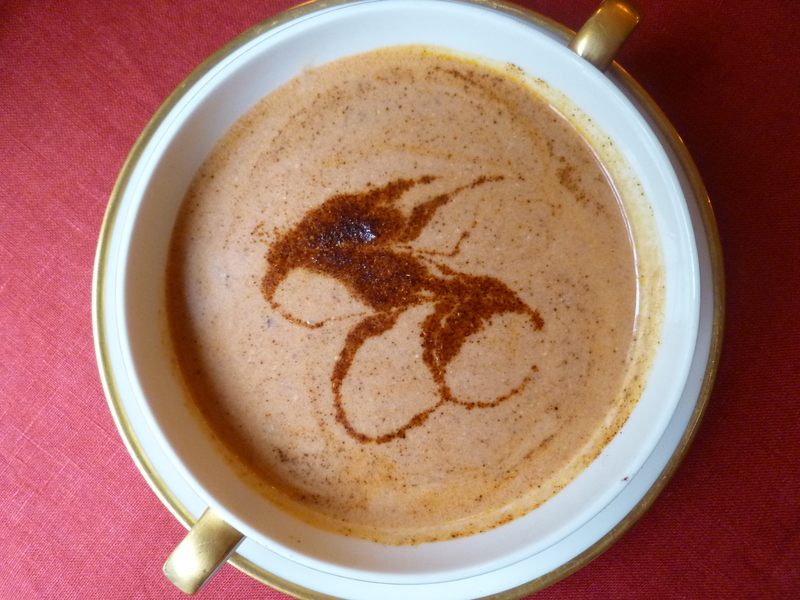 A Note: The First Course in the Lunch Menu: Southwestern Elegance is Cream of Pecan Soup. In this Menu, each bowl of soup is served with a fresh flour tortilla, folded into quarters and placed on a small plate beside the bowl. The recipe for Fresh Flour Tortillas is found here at the diplomatickitchen. 1. 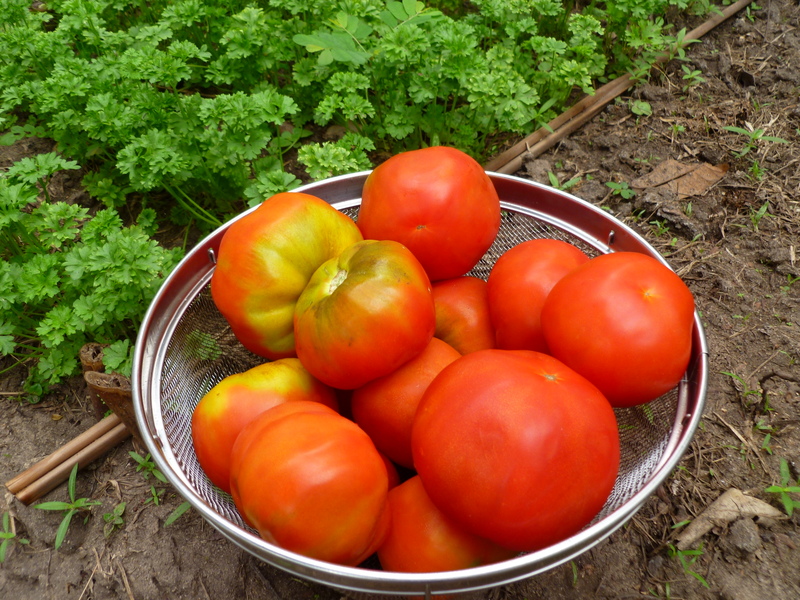 Blend the fresh tomatoes and the canned tomatoes with their juice in a food processor or blender. 2. Heat about 1 Tablespoon of olive oil and saute the garlic until it begins to brown. 3. Take the pot off the heat to cool the oil and garlic a little so that the tomatoes don’t spatter when you add them. Then add the puree of tomates. 4. Simmer the mixture, uncovered, for about 30 – 35 minutes, until it thickens. 5. Taste the sauce. Season it with freshly ground salt and pepper. Add the oregano and a pinch of sugar. 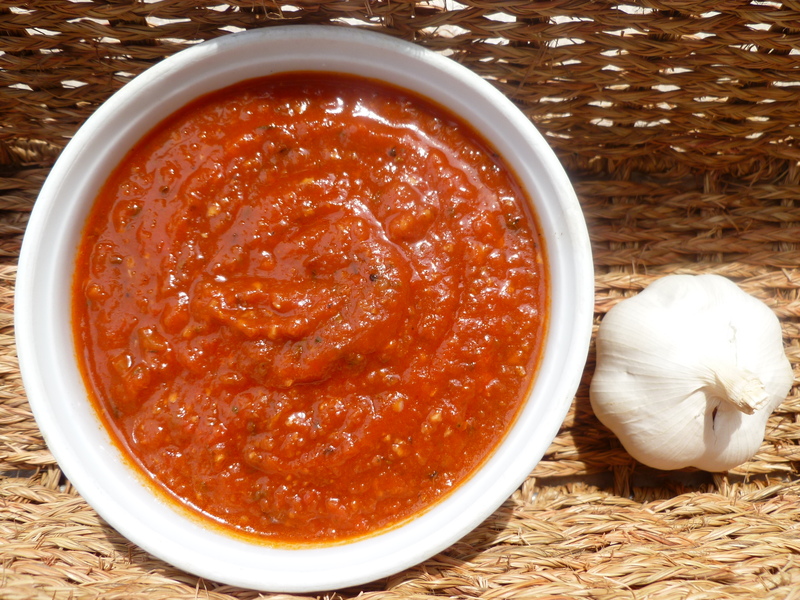 Let the sauce sit for a few minutes, then taste it again and adjust the seasonings further, as you like. 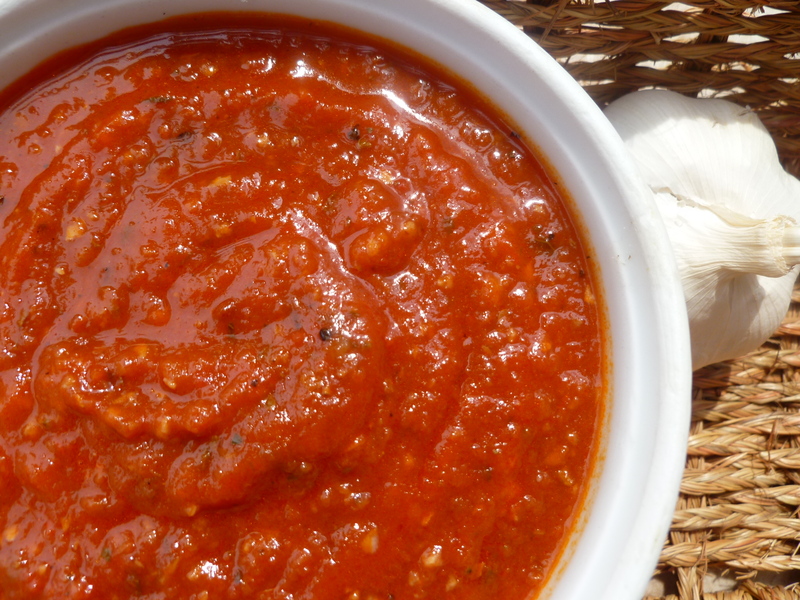 A Note: Homemade Fresh Tomato Sauce freezes well and is very good on pizzas. diplomatickitchen is hosted through WordPress.com.